You can order your calendar right now for prompt shipment from our Fybush.com Store – and don’t forget that with a subscription to Fybush.com (they start at as little as $15 a year), you get access to 15 years’ worth of these Tower Site of the Week installments, all neatly indexed by state – plus full access to every Monday’s NorthEast Radio Watch. Thanks for your support! For the last few months here on NERW, we’ve been showing you a whole bunch of sites that are a long way from our home base in the northeast. While it’s fun to do things like a cross-country drive and a deep dive into the sites of southern Indiana, our heart is still back in “NERW-land,” and especially in the town where the column was born way back in the early 1990s. 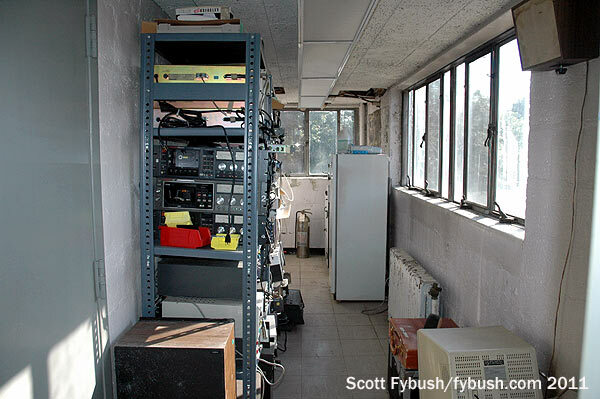 Amazingly enough, for all of the time your editor spent in Boston radio, I left Massachusetts in 1997 without having been inside most of the transmitter sites in town, and it’s taken a whole bunch of trips since then to rectify the situation. 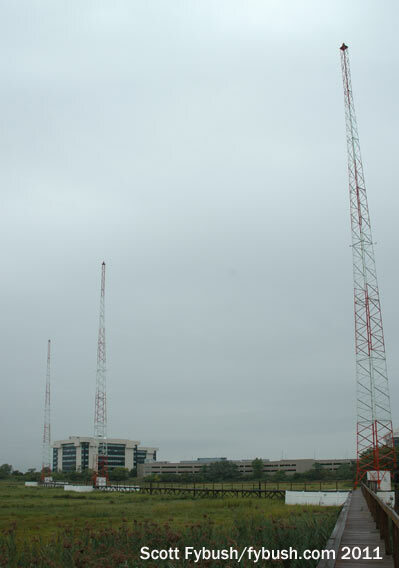 These pictures are from a fun visit in the fall of 2011, in which I filled in several gaps in my collection of Boston transmitter visits. That included the 1150/1470 site in Lexington, as seen in Tower Site Calendar 2013 and on this page a year or so ago. And as long as we were in the genial company of Salem Broadcasting’s Boston engineer, Frank Kelley, we wondered about seeing some of his other sites around town…so off we went to the northern suburbs of Boston to see two more of Salem’s AMs. 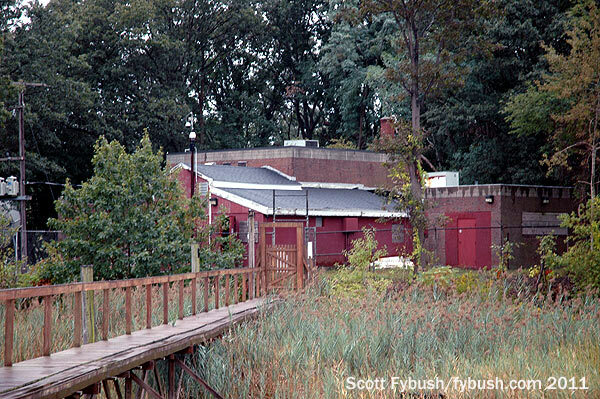 Just off Wellington Circle in Medford sits what I believe to be the oldest AM site still in use in Boston. 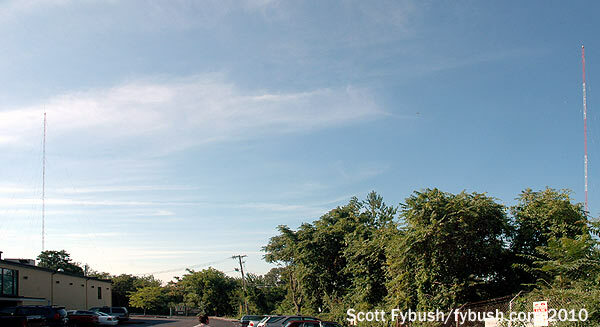 Dedicated on April 6, 1937, this site on Mystic Valley Parkway was built by CBS for what was then WEEI on 590, running 5000 watts by day and 1000 watts at night (later increased to 5000 watts fulltime) from two self-supporting towers behind a magnificent Art Deco building with a two-story curved glass block window and dramatic backlit call letters. 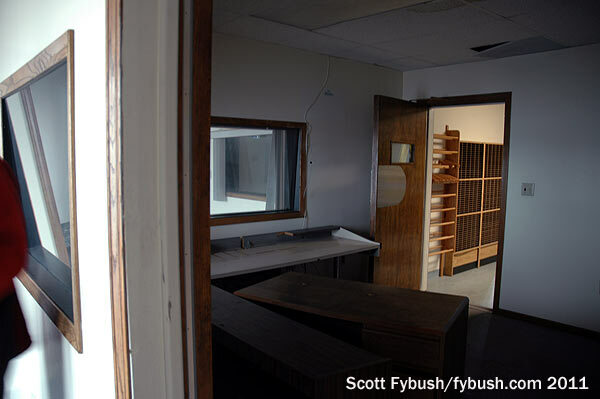 Today, a visit to the old WEEI site still reveals traces of the old Art Deco flair. 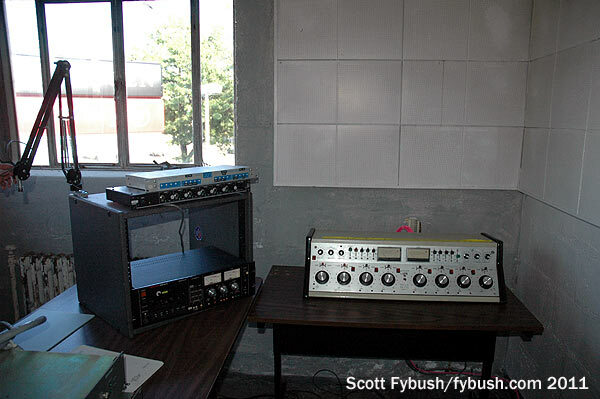 The original two-story transmitter room behind the glass block has been walled in, with a dropped ceiling inserted to reduce it to a single story. It’s worth noting that WEEI paved the way for many more AM stations to locate near Wellington Circle. 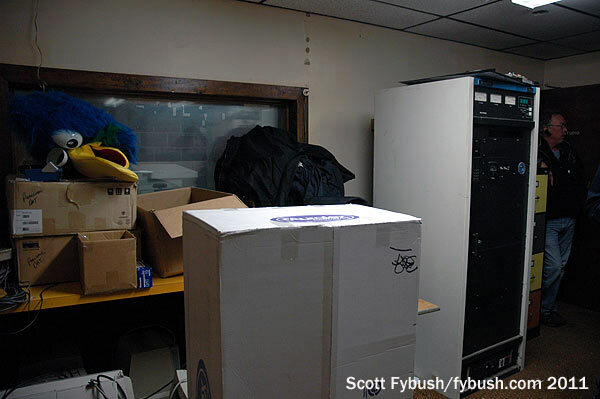 Within not much more than a decade after WEEI signed on here, new sites went up nearby for WHIL on 1540 (later 1430, and today known as WKOX) and for WBMS on 1090 (later WILD); they now share the old WHIL site, and we saw them on a visit here in 2010. From Wellington Circle, Route 16 heads eastbound to the sea, but before we get all the way there, we turn northward on Route 107 and make our way up to Rumney Marsh, where the eastern edge of Saugus meets Revere to the south and Lynn to the north. 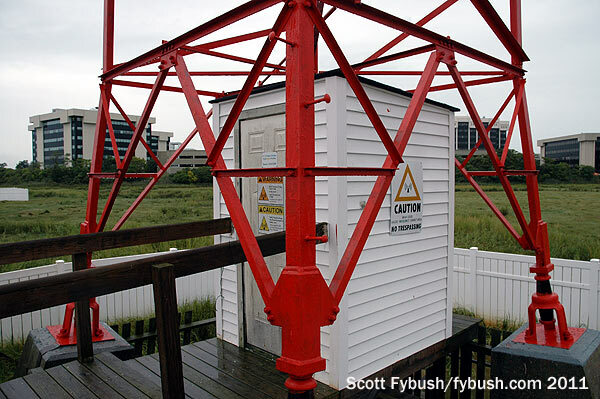 It’s here, on a little spit of land extending eastward from 107 into the marsh, that we find another venerable transmitter site. 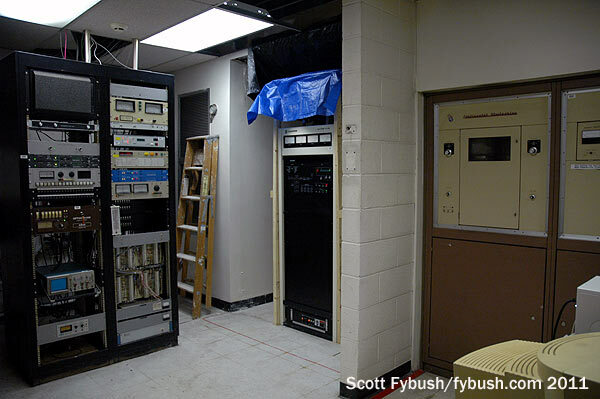 This was home to WHDH on 830 and later 850 from 1932 until the present 850 transmitter site went up out in Needham after World War II. After WHDH moved out to the west (allowing it to use a nighttime directional pattern that protected co-channel KOA in Denver), the Rumney Marsh site ended up on the receiving end of a reverse swap with the western suburbs. 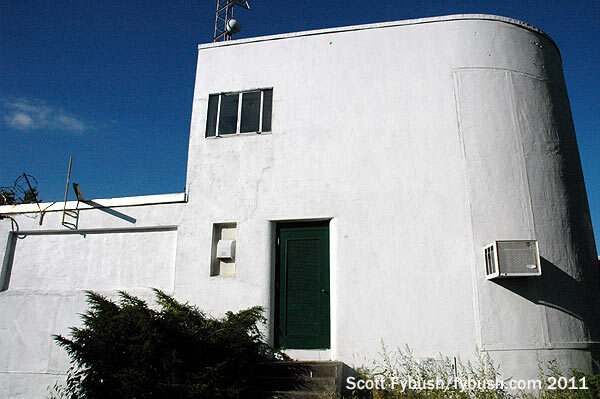 In 1950, the new incarnation of WORL (a venerable Wellesley-based station that had lost its license in 1949) signed on from the former WHDH site, replacing WHDH’s two towers with a single 279-foot self-supporter. Over the years, WORL became WRYT and then WROL (the WORL calls having departed for the Orlando, Florida market), spending many decades in the hands of Carter Broadcasting before being sold to Salem in 2001. 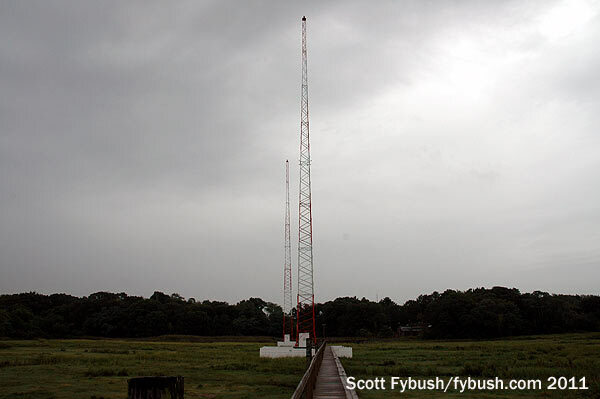 Salem’s purchase meant the end of studio operation out here in the Saugus marsh, as well as the end of a plan to add two more towers out here to give WROL a more potent night signal than its present 90 watts. 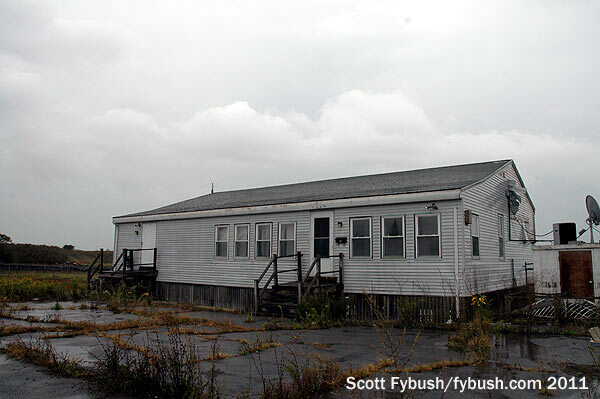 Today, the former WROL studios sit quiet and empty out here, with big picture windows looking out at the scenery of the marsh, where a storm is rolling in during our visit. 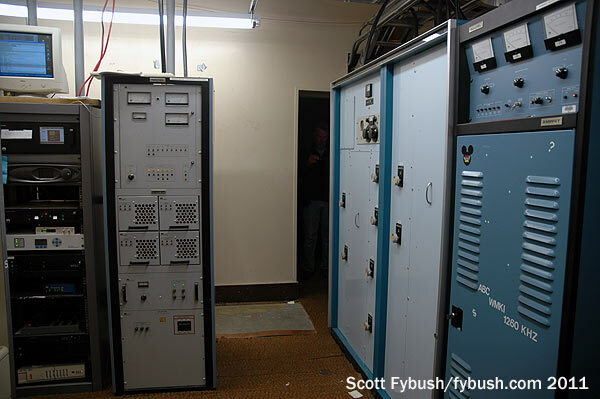 The Carter-era transmitter room, where a Harris MW5 sits next to a Nautel AMPFET, was also quiet; there’s a newer Nautel sitting in what used to be a storage room behind the MW5, and it’s that AMPFET that now powers WROL’s 5000-watt day signal. We promised you we’d return to the 1260 piece of the Boston AM story, and this 2011 trip included that chapter as well, as our rainy day took us south of the city to the end of Riverside Avenue in Milton. This site dates to 1943, when the Yankee Network relocated its Boston flagship station WNAC (1260) from a previous site not too far away in the Squantum section of Quincy and sent sister station WAAB (1440) off to Worcester. 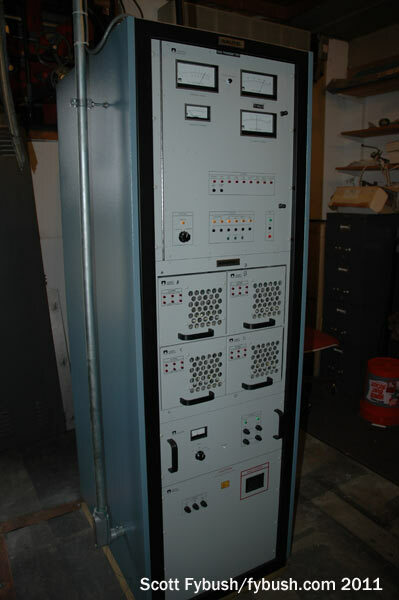 By going directional with three towers, WNAC was able to go to 5000 watts fulltime, though its spot high on the dial still made it a lesser signal than its competitors, especially 50,000-watt WBZ. For a structure that was built during wartime (WNAC had special permission to move forward with construction, since it already had the materials on hand), this is a fairly substantial brick and concrete building that must have been an impressive sight when it was new, before the windows got filled in. Within just a decade after opening day, this site was on the way to new chapters of a very complicated history: in July 1953, the FCC signed off on WNAC’s purchase of 50,000-watt WLAW (680) and its sale of the 1260 facility to Pennsylvania broadcaster Vic Diehm. 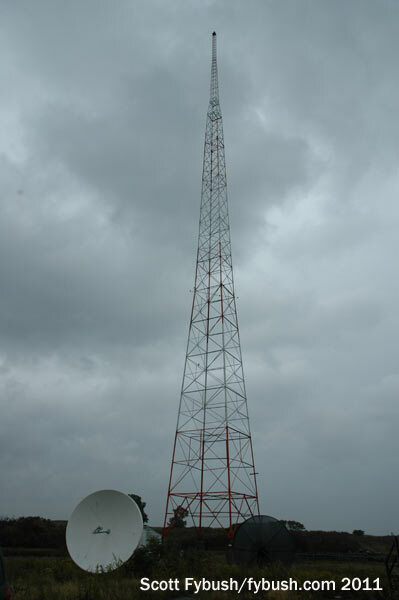 Within the space of just a few hours, WLAW signed off, Diehm moved into the former WLAW studios in the Hotel Bradford (which had in turn been the home of WBZ before its studios moved to Allston in 1948), and the 1260 transmitter site in Milton became the home of new station WVDA. Diehm’s WVDA lasted only four years before becoming WEZE, and WEZE in turn went through a series of music incarnations that included a long run with beautiful music and then top-40 from a streetfront studio in Copley Square. 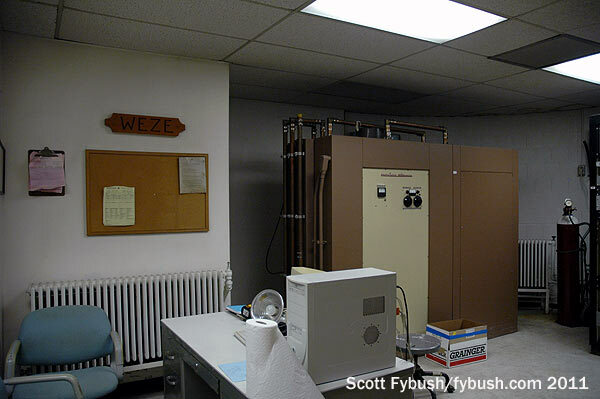 A 1977 sale to New England Continental Media, a predecessor of today’s Salem, turned WEZE religious and moved its studios out here to the transmitter building. 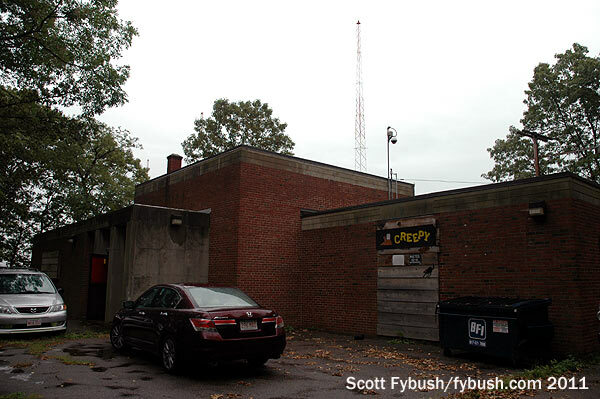 Salem owned the station for almost exactly 20 years before selling it in 1997 to Hibernia Broadcasting, which flipped it to Radio Disney, changed calls to WMKI and eventually sold the station to Disney itself. 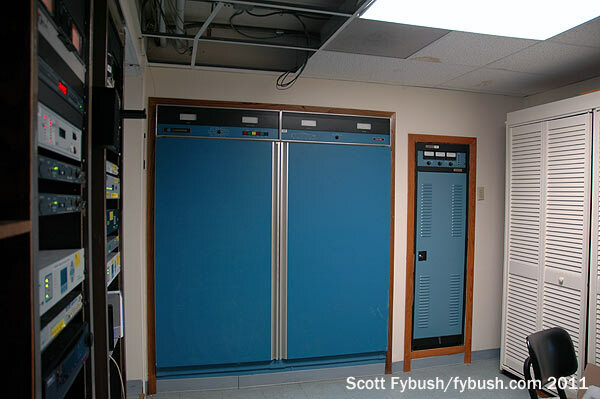 Hallways leading in two directions from the transmitter room go to former studio spaces, now used for storage. 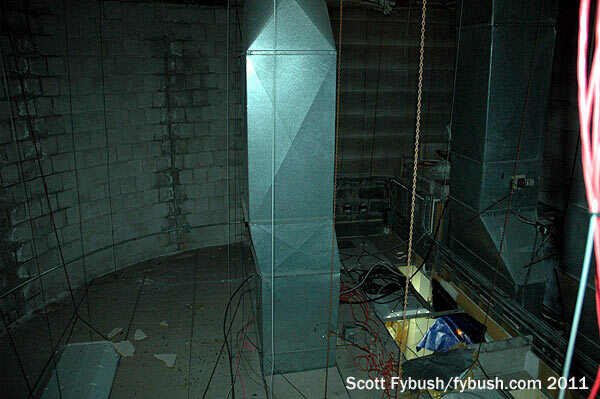 There’s a room in back that I think served as the transmitter room when WEZE had its office here, and it in turn leads out to the catwalk that runs out into the swamp where the three self-supporters sit. Thanks to Salem’s Frank Kelley and WMKI’s Lee “Doc” Brown for the tours! Next Wednesday: More Tower Site Calendar 2015 previews!